To keep a boy out of hot water, put him on ice. Not all Canadians are big hockey fans, and I am in the camp that is not. So, a book about hockey and a bunch of ancient hockey players? It doesn’t sound very appealing to me, but I put my qulams aside and trusted in the many people who have loved this book since it was written in 1987, while in the process fulfilling the ‘Q’ requirement for my A-Z CanLit Project. Goodreads synopsis: Percival Leary was once the King of the Ice, one of hockey’s greatest heroes. Now, in the South Grouse Nursing Home, where he shares a room with Edmund “Blue” Hermann, the antagonistic and alcoholic reporter who once chronicled his career, Leary looks back on his tumultuous life and times: his days at the boys’ reformatory when he burned down a house; the four mad monks who first taught him to play hockey; and the time he executed the perfect “St. Louis Whirlygig” to score the winning goal in the 1919 Stanley Cup final. But did I like this book about hockey? Yes! (Partly because it’s not really about hockey.) Although I did find some parts hard to grasp until I went over to hear the conversation about it on Write Reads. They cleared a few things up for me, and confirmed some inklings that I had. First off, this is not really a funny book even though it’s billed as one. It’s written in a humorous way; specifically the dialogue (inner and outer) of Percival Leary, but the subject matter is dark. Some parts of the book were even heart-breaking. (I agree with you Tania that Manny’s story is so sad!). The genius of Paul Quarrington is that he can tell this bleak story in a way that feels entertaining; until you think about it and realize that it is actually quite depressing. He slips in subtle jokes that the reader can see but the character doesn’t recognize, which in the end makes the character seem even more pathetic. A re-read of this book I’m sure would bring even more of this subtlety to light. It’s good to go into this book knowing there is a lot more going on than meets the eye. 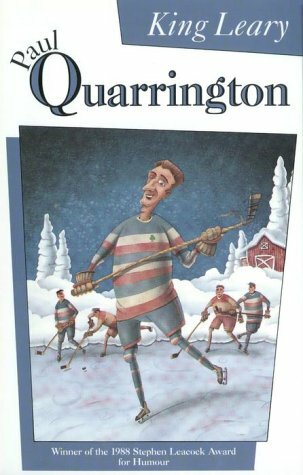 Another thing I liked about this book was the nostalgic feeling of the ‘good old days’; a bunch of kids outside playing hockey on the pond, wearing big sweaters and no helmets. And I think things could have gone more merrily along for Percival Leary if it hadn’t been for his ‘friend’ Clay moving to town. The first thing he ever did to Percy was punch him, and then they were life-long ‘buddies’ after that. And never mind the ‘lit bag of doggy-doo’ trick gone wrong, causing Percy to be sent to the monastery to be ‘reformed’. But Clay keeps coming back – he won’t go away. And he, in my opinion, is the catalyst for everything else that goes wrong in Percy’s life. Would Percy have turned out the same without Clay? Maybe. But we’ll never know. Maybe I shouldn’t say this, considering what I became to the city, but I didn’t think much of Toronto the first time I saw her. At sixteen you think a city should be full of cowboys, bosomy ladies, Indians and scoundrels, carnivals and taverns, fistfights and love affairs, mooks with tattoos on their faces, women with garters above their knees – in short, the kind of place where Blue Hermann’s been living most of his life, wherever the hell that is. But Toronto looked as if it had been designed and built by a committee of Sunday-school teachers. This was the early times with Manfred. I allowed as he probably could go for a glass of beer. We didn’t know so much about the whole deal back then, didn’t even have the word “alcoholic.” That came up in the forties while my boy Clarence was busy becoming one. I married Chloe Elizabeth Millson in the summer of nineteen twenty-three. How this event transpired is still something of a mystery to me… The deal was, Chloe would have no compunction against stripping off and swimming in my sight all in the buff-bare… and I in turn would join her in holy wedlock. Back in those days, that was the kind of deal you made. It sounds as if you feel much the same way about hockey as I feel about football, Naomi, but I loved Nick Hornby’s Fever Pitch so you never can tell. Hmm, I don’t think I’m going to run right out and buy this one. Did it have anything to do with King Lear or is that just a jokey title? There were definitely echoes of King Lear, but they are not hugely obvious to someone who is not on the lookout for such things (like me). I did have a small think about it, though, because the title so strongly suggests it. A Shakespeare enthusiast may be able to pick out more similarities than I did. In fact, someone should do just that – I would be interested to know! Does he have three daughters, for example? Maybe check out my review of 1000 Acres and see if the plot sounds familiar. He has 2 sons, but one of them is ‘cast out’ in a way, his father holding something against him all these years that it turns out he didn’t even do. The other son is the culprit and has known it all this time but has never said anything. In any case, neither of the boys should be held responsible for the unfortunate event since they were just very young boys when it happened; their father is being unreasonable. Well, that’s certainly from King Lear, one of the subplots. This sounds like more of a classic CanLit book. but I’m weirdly drawn to it. I didn’t grow up loving hockey (that whole immigrant thing) but have developed an appreciation for it thanks to my husband (who loves all sports and has an encyclopaedic knowledge of sports stats, plays and history). I hadn’t actually thought to go back and read all the Canada Reads titles but maybe I should…this one is definitely on my radar now thanks to you! Oh good! If you’re drawn to it, you should definitely read it. Then you can tell me what you think! If you don’t like to read about alcoholism, then I guess you better avoid this one. There’s a lot of imbibing! Almost too much, really. Despite the bleak story, it’s written in an entertaining way, which kind of distracts you from the darkness. But you’d be caught off guard if you went into it thinking it was just plain funny. If you like sports novels, then you might want to give this one a try! I really should think about joining a reading challenge this year. It’s never too late, right? I’m thinking of doing Book Riot’s Read Hearder challenger. We’ll see. I appreciate that the bleak story is told in an entertaining, and sometimes lighthearted way. You know I don’t shy away from books with difficult subjects, but sometimes I need levity in my life. The humour definitely makes the book much easier (and more fun) to read! I love writers who are able to write about heavy stuff with a light touch. I think it would be hard to do. It’s never too late to join a challenge! The Book Riot Read Harder sounds like a good one – I’ve been tempted by it myself. This sounds like a book I would love–it has a very Richard Russo flavor to it, from the excerpts you chose. I’m glad you read and reviewed it! I really have to read one of Russo’s books, so I’ll finally know what you’re talking about. I own Empire Falls, but for some reason I feel like it’s not going to be good enough. What do you think? I’m in the same boat, Naomi! Waiting to get to Empire Falls which has been sitting on my shelf for several years now. I have not read Russo yet either but Carolyn is the one to talk to! She had recommended one or two of his books in particular. Funny, I was a huge hockey fan as a teen! I think this sounds interesting because of the deeper subject matter, especially as the mom of a boy I’m (as we’ve chatted about before) interested in stories about boys and men. Have you read The Art of Fielding? That was another popular book centered around baseball but really not about baseball. I also have it on my shelf and am wondering when I will get to it. Haha. Another book we share on our shelf-to-be-read! I also have The Art of Fielding but haven’t read it yet. I don’t know why, but I wouldn’t have pictured you as a huge hockey fan. But, then again, most people are surprised when they find out I like football. 🙂 It’s partly what we are exposed to, I think. My Dad watched much more Football than Hockey, and I would sit down and watch it with him. Haha, in my comment I actually started to explain how I got into hockey but then deleted it…it was because these girls I was friends with at the time loved hockey, and I ended up having a crush on one of the players 😉 But I did start watching the games for the games themselves! I agree about the exposure. I actually loved basketball in the same way – it was the game my dad watched. A lot of women love football, I have found! Basketball is another one I like! That one is partly because I was actually half good at it myself once upon a time. That is awesome, Naomi! And you can still play that with your kids! 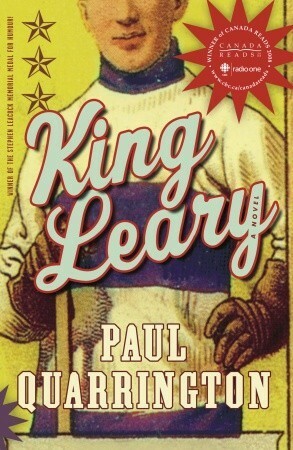 I’ve been interested in King Leary since Rick reviewed the book. I’m also weirdly attracted to this book because of all the Canadian elements. Following the conversation about humour, it makes me think about the discussion we had also about the lack of funny CanLit. This book is funny and not funny at the same time. I don’t really know how he does it – I think it would be hard to do. If you feel interested in it, and in a Canadian book that might make you chuckle, then you might want to try it. His other books might be similar- I’m curious to try them. I think there is lot of CanLit to choose from if you’re looking for something light or funny!